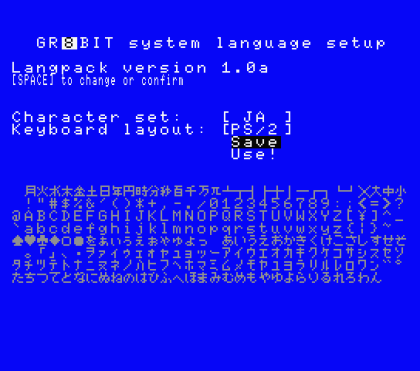 Language pack allows you to easily switch between locales - character sets and keyboard layouts, without need to change GR8BIT main ROM chip or its contents. These properties may be changed independently, but not all combinations are valid. 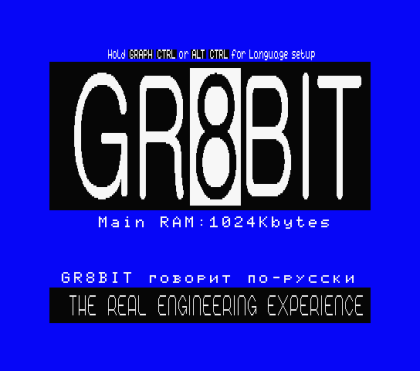 When GR8BIT starts, you may press and hold GRAPH and CTRL keys (for compatible keyboards) or ALT and CTRL keys (for PS/2 keyboard) to invoke Language configuration menu. During the initialization you can see the current saved configuration - Japanese character set (fig. 1a), or Russian character set (fig. 1b). If no configuration displayed, it is assumed that international or Portuguese character set is selected. Once you got to Language setup menu, you can select character set and keyboard layout from the list (fig. 2). Fields in brackets are changeable by the pressing and releasing space key. Item Save is used to save settings to the RTC chip (non-volatile memory) so that GR8BIT remember your preference and next time start with saved locale configuration. Item Use! does not save locale settings to the NVRAM, but exits setup program using selected settings for current session. If you do not save settings to NVRAM using Save item, your changes will be lost after next reboot or power cycle. You also have an opportunity to change Language settings in the BASIC using LANG command. Argument <charset> is required, argument <keyboard layout> is optional. Character set is assigned as follows: 0=Japanese, 1=Russian, 2=International, 3=Portuguese. Keyboard layouts are: 0=Japanese, 1=PS/2, 2=Russian, 3=International. Keyboard you connect should be PS/2-type keyboard. You may have PS/2 keyboard connected to the GR8BIT before power up, or after power up. As soon as keyboard gets power (after power up or after it got connected to your GR8BIT), microcontroller initializes it. This initialization takes about 4 seconds, and is exhibited by flashing keyboard LEDs. You should not type or press/release any keyboard keys during this time. Therefore if you wish to get to Language Pack setup menu, please wait until keyboard will complete initialization and only then press CTRL and ALT keys. * Please note that information described in this section applies to GR8BIT PS/2 keyboard microcontroller firmware version 1.0b and above. Unfortunately due to electrical conflict both devices - PS/2 keyboard and Compatible MSX keyboard - can not be used simultaneously. If PS/2 controller is active and Compatible keyboard is connected to GR8BIT, PS/2 keyboard will work properly, but Compatible keyboard may not. Use both PS/2 and Compatible keyboards, one at a time - configure JP2 on the GR8BIT main board according to your Compatible keyboard specifications, and open main board's jumper JP4 (as described in GR8BOOK1 section 3.10 and GR8BOOK2 section 3.5). You use PS/2 keyboard when PS/2 controller is enabled. If you wish to use Compatible keyboard (e.g. 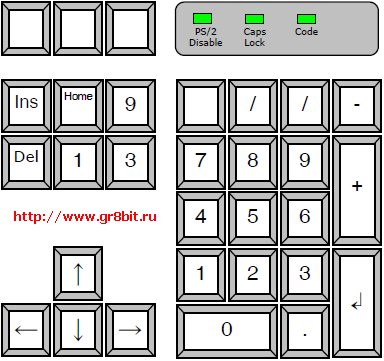 for gaming), you disable output of PS/2 controller by pressing F12 key on the PS/2 keyboard (Num Lock LED will turn on), and then Compatible keyboard works without issues. If you want to use PS/2 keyboard back again, press its F12 key to enable it (Num Lock LED will go off). Alphanumerical assignment may slightly differ between locales. Alpha keys: lower case letters when SHIFT is released and CAPS is inactive, and when SHIFT is pressed and CAPS is active; otherwise capital letters. Missing character from character set and layout: ヮ.
KB article release notes: KB0004 was initially released on March 03, 2012, covering operation of Language pack only. It was re-released on August 14, 2012, to cover operation of the PS/2 keyboard. End of KB0014 "Using GR8BIT Language Pack and PS/2 Keyboard".